Myles Turner and the Pacers couldn't get closer than seven until the final seconds. 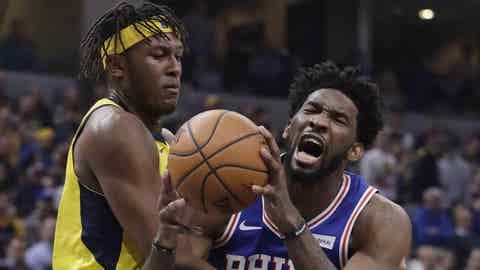 INDIANAPOLIS — The Philadelphia 76ers finally found a solution to their road woes Wednesday night. Joel Embiid scored 20 points and grabbed 10 rebounds and Ben Simmons flirted with a triple-double, leading the 76ers past Indiana 100-94 for their first non-home court victory this season. So just three nights after an inexplicable 25-point loss at Brooklyn, Embiid, Simmons and their teammates felt right at home in one of coach Brent Brown’s favorite NBA arenas. They quickly jumped to a 19-9 lead, weathered Indiana’s rally, then regained control by closing the third quarter on a 6-1 flurry and opened the fourth with a decisive 16-7 run. When it ended on Simmons’ breakaway layup with 6:04 to play, Philadelphia led 94-77. The victory spoiled Victor Oladipo’s best night of the season. But Oladipo and Domantas Sabonis, who had 16 points and 11 rebounds, needed more help from their supporting cast to avoid losing their second straight home game. And when they didn’t get it, the 76ers took advantage. 76ers: Had lost their last two to the Pacers. … Robert Covington had 13 points, Landry Shamet had 12 and J.J. Redick scored 10. … Redick has scored in double figures in 21 consecutive games since March 26. … Philadelphia made 18 of 22 free throws but had only four offensive rebounds. … Saric also had seven rebounds while Embiid had three blocks. Pacers: Have lost consecutive home games for the first time this season. … Indiana is 5-2 against the Eastern Conference and 3-1 against Atlantic Division opponents. … Oladipo extended his career-best streak of consecutive 20-point games to 11. … Sabonis has scored 1,002 points since joining the Pacers last season. … Indiana was 12 of 17 from the free-throw line and 8 of 31 on 3-pointers. … the only other player in double figures was Bojan Bogdanovic with 13.